-Make sure your contractor examines all windows and other materials upon delivery. If there are any defects, broken glass, etc., take pictures to document and send to the supplier. This avoids them saying that it happened on-site and trying to avoid free replacement. 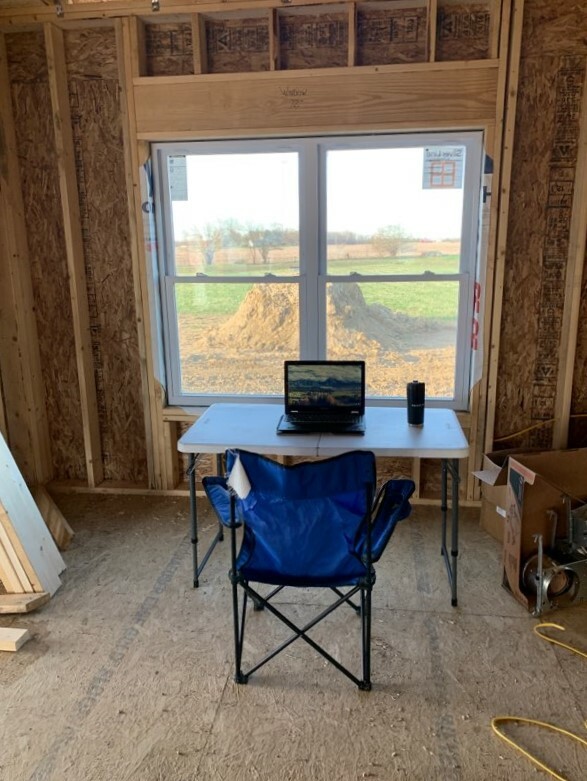 With the house being closer to getting enclosed, we realized that we needed to get busy with making some product selections for the house. We have been getting quotes for a front door for months, looking casually at lighting options, and pricing flooring. It was now time for us to lock in some of our selections as provisions would need to be made based on our selections. 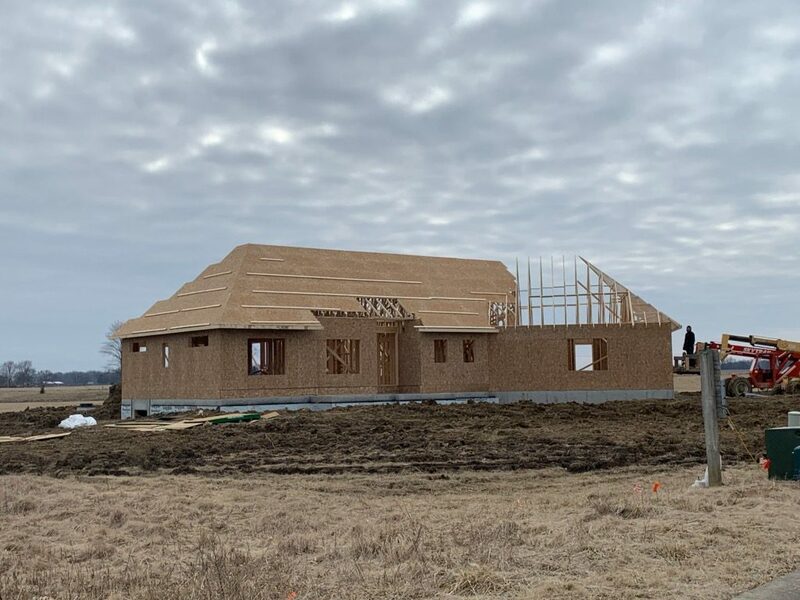 With the house finally being enclosed, we will hopefully be getting on the schedule with all the subcontractors. When the framing crew finished with setting the trusses, it was time for them to install the roof decking. Before they could start installing the 4’x8′ sheets of structure wood, they had in install 2”x6” boards on the truss tails. This board will have trim, soffits, and gutters attached to it later in the process. 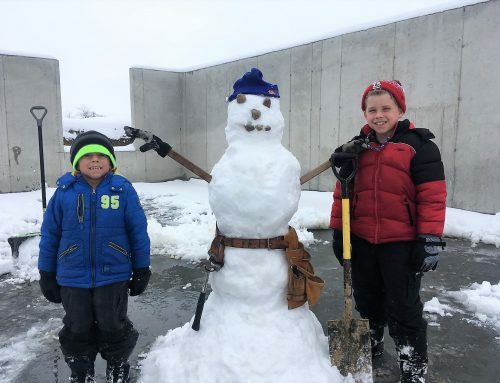 In order to ensure that the overhang would be a uniform distance around the entire house, the framers measured 16” out from the wall on both ends of a wall. They then used a chalk line to snap a line across all of the ends of the truss tails. If the tail was too long, they would trim it to the correct length. In some cases, the tails were too short so they had to cut and fasten 2”x4” pieces as extensions. Once all truss tails were the desired length, they would install the 2”x6” gutter boards. With the gutter boards installed, they crew was ready to start putting on the decking. They used the lift to raise several pieces at a time to roof height. The fastened one sheet at a time starting on the first row. With the first row of decking installed, they nailed on 2”x4”s. These served as “toe boards” for them to walk on since the roof was too steep to move around without. Before they could install the second row, they installed H clips between the trusses on top edge of the decking. The second row of decking will slide down into these clips and prevent the decking from sagging in between the trusses over the years. The next row of decking was installed, toe boards were added, and the process was repeated until they reached the top of this section. Decking installed on the main roof section. Once they had installed decking on the main roof section of the house, they had to build rafters that would tie the other roof lines/sections into the main roof. 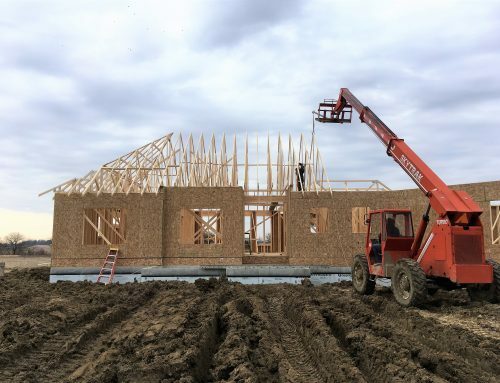 They had to build these by hand as it is nearly impossible for the truss company to manufacture trusses that would fit correctly with the different angles and roof pitches. After these rafters were complete, they continued the same decking process on these sections. Next, the framers had to build the gable on the front of the garage. The gable is purely decorative so it couldn’t be built until all the other decking was complete. To begin, they found the center point of the gable, which was center above the two windows below. They then installed one gable truss with an angle cut on the bottom. They installed this truss, fastened a brace, and checked to make sure it was plumb. 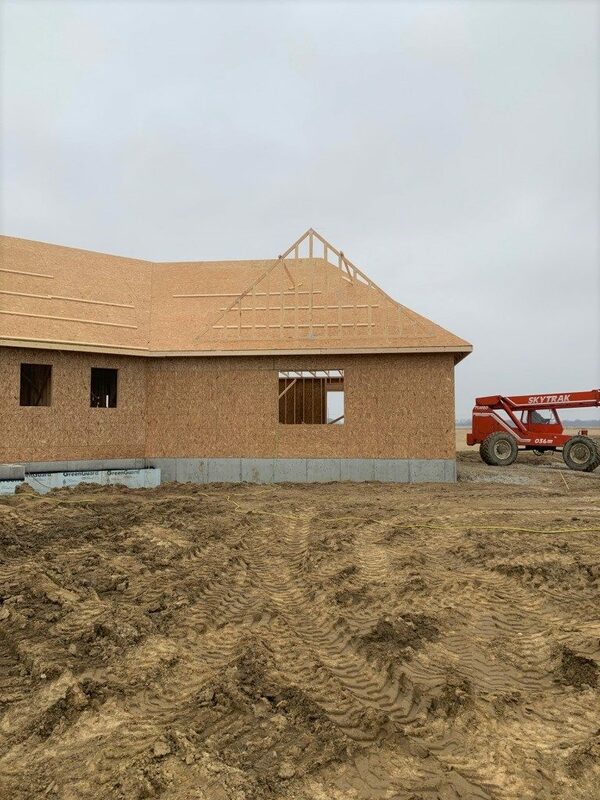 Gable truss installed centered over the window. 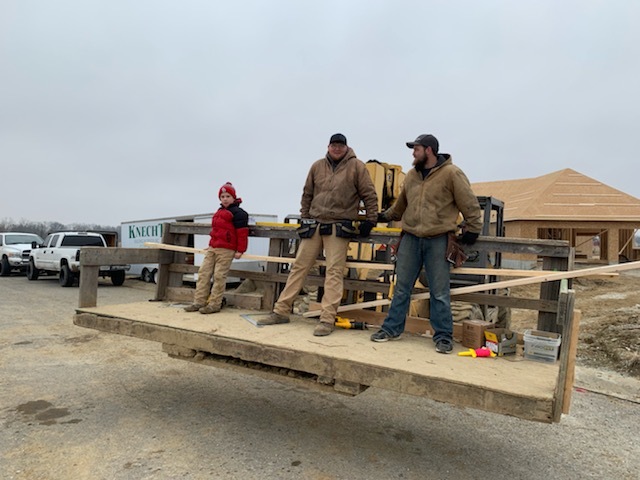 Caleb catching a ride on the lift platform with the framers. Once secure, they began the process of building the rafters back into the main roof. They chalked lines to make sure the valleys on each side of the gable would be straight and then built the rafters one at a time. When all of the rafters were finished, they installed decking on the roof and sheeting on the front of the gable. This gable gave the front of the house a little more character. 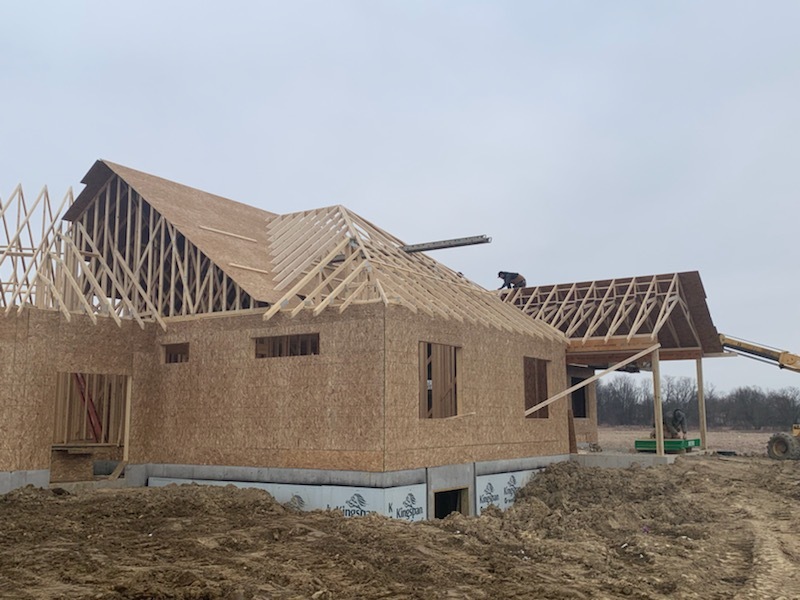 With all of the rafters built and decking installed, the framing crew was finished with the roof system. Roof system complete aside from the porch roof. Why not jump out of the windows?!? With the roof system complete, Keith called the roofing crew to come out and install the synthetic felt. 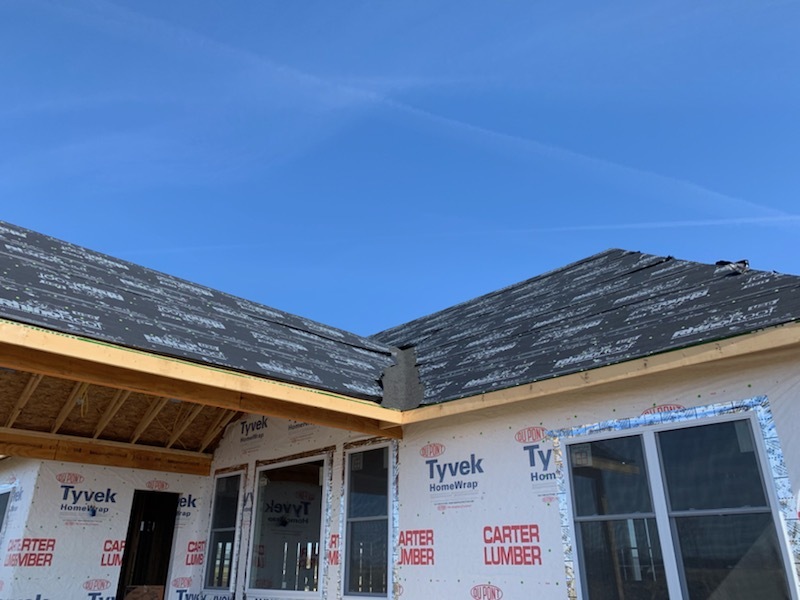 Although they wouldn’t be installing the shingles for a few weeks, the felt would keep water from entering the house between all of the cracks in the decking. 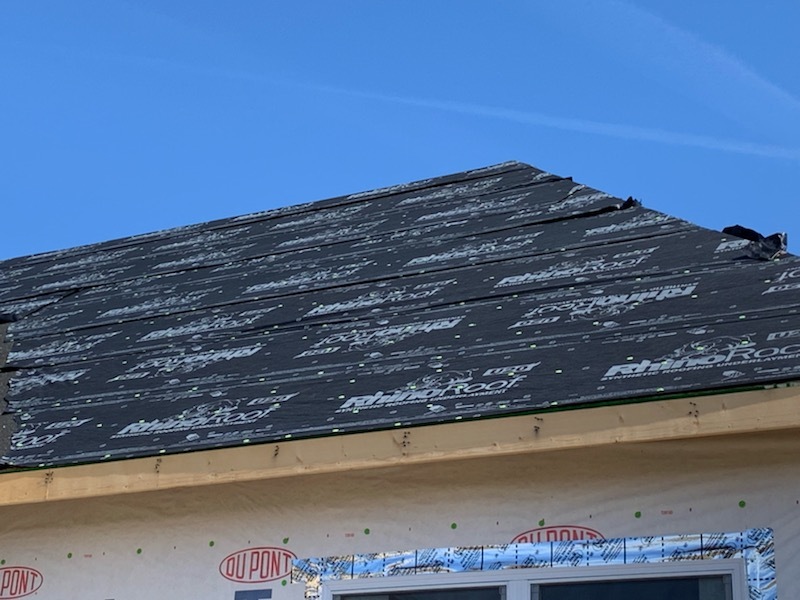 Before they could install the felt, the crew installed ice/water shield in the valleys (the area where two separate roof lines meet). This is a flexible asphalt material that has adhesive on the back that holds it down and is not fastened with nails, as that would provide the potential of a leak over time. You can see the ice/water shield in the valley were the two roof sections meet. After the ice/water shield was installed, they began installing the synthetic felt. This material came in 4′ rolls and is fastened by cap nails. First, the roofing crew had to remove the 2×4 toe boards previously installed by the framers. Next, they ran the first run along the bottom of the roof. Then, they continued working their way up the roof allowing a couple inches of overlap on the run below. Once the felt was installed on the entire roof, there should be limited water that will make it into the house. This will allow the subcontractors to start working inside even though the roof isn’t installed. Synthetic felt fastened with cap nails. 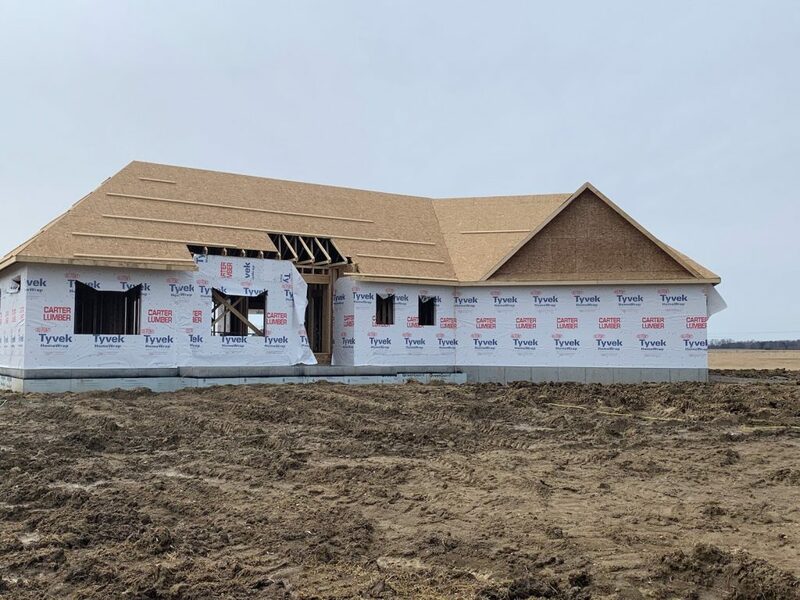 Another task for the framing crew was to install house wrap over the sheeting on the sides of the home. 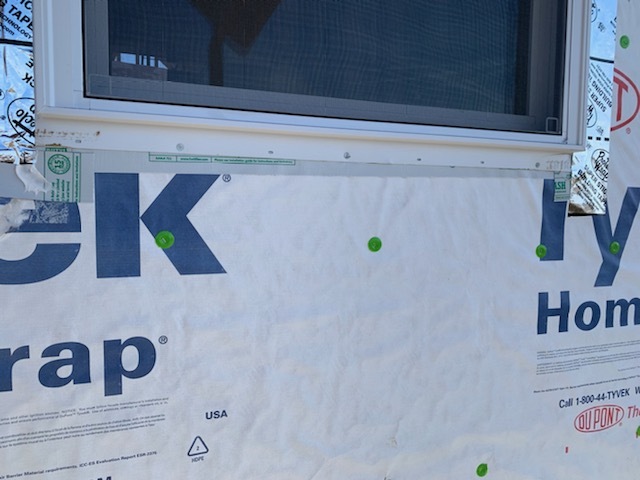 The purpose of the house wrap is to provide a moisture barrier behind the siding, stone, brick, etc. The product won’t allow water to penetrate from the outside it, but it will allow air and any moisture to pass from the inside out. 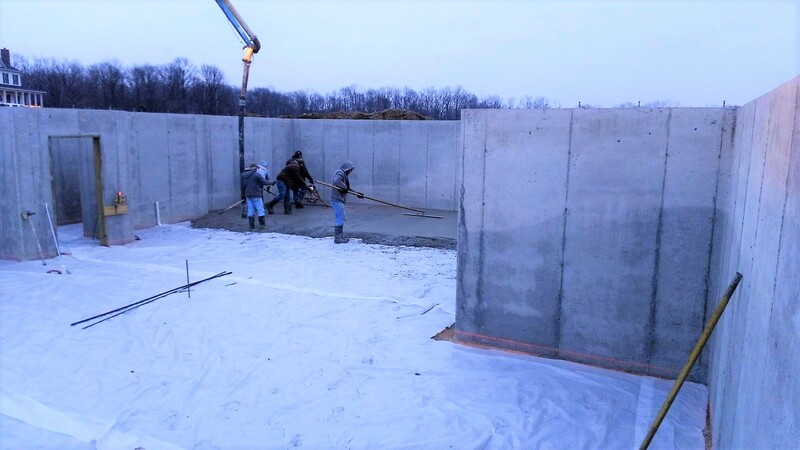 This eliminates the possibility of moisture being trapped on the sheeting and creating a mold problem. 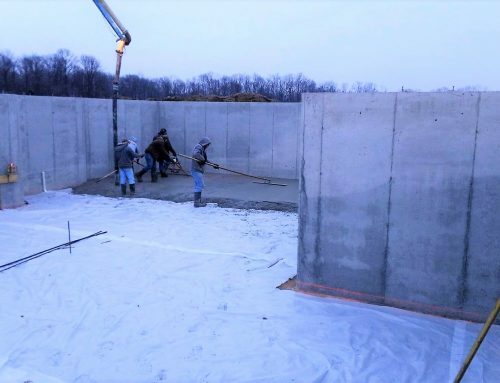 The house wrap comes in 10′ rolls so it’s continuous from top to bottom of the walls (9′ walls + 1′ floor joists). 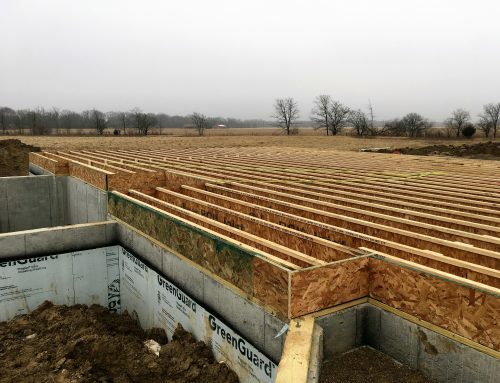 The framers started at one corner and rolled out small sections at a time. One worker would pull the roll tight while the other used a cap nail gun to fasten it to the sheeting. They continued this process around the entire house. Once finished, they had to cut an X through the window openings and staple the wrap around the inside edges. 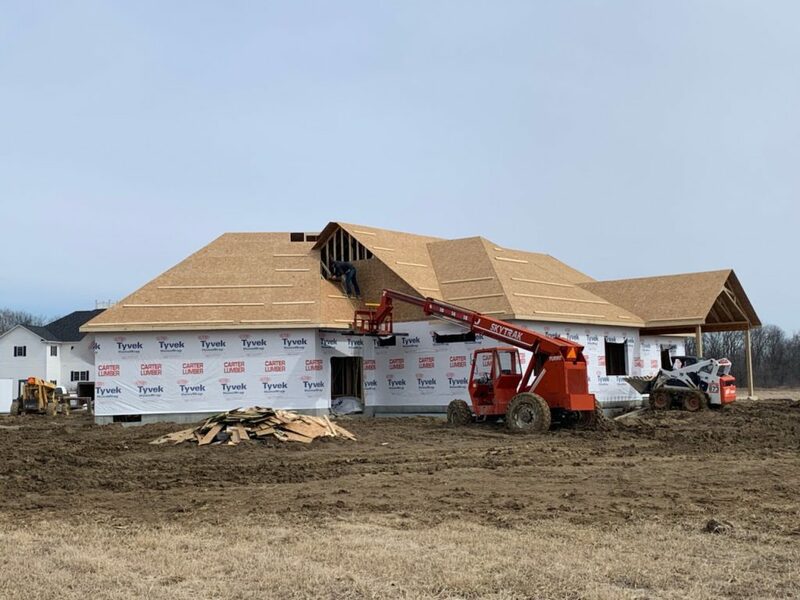 With the synthetic felt on the roof and the house wrap around the exterior, it was time for the framing crew to install the windows. 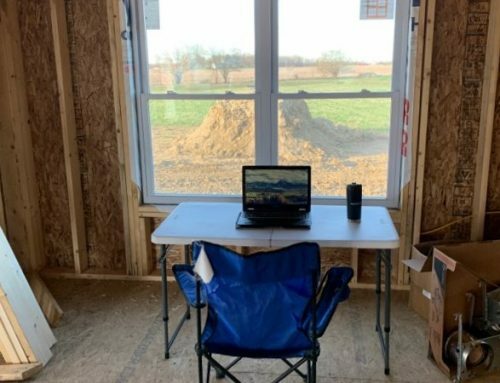 The windows were delivered and placed in the garage initially. While they were being carried in, the workers noticed that one of the windows had a crack in one of the panes of glass. Keith immediately took pictures to document the fact that it was delivered cracked and would need to be replaced. 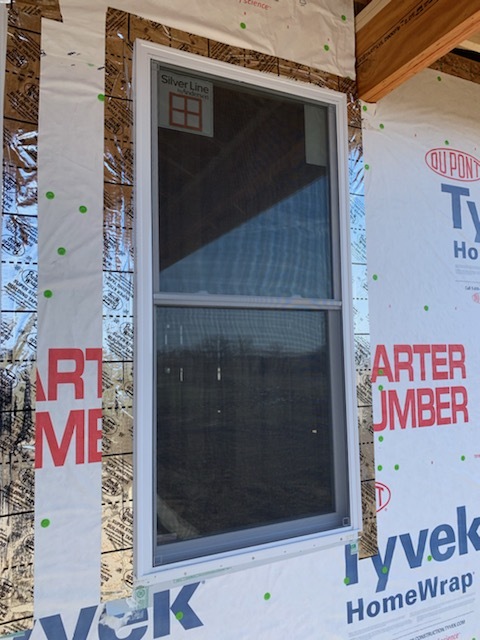 Before the windows could be set, Keith applied a flexible flashing material along the sills of all the window openings. This would prevent any water from getting underneath the window and running down behind the vapor barrier. The window was cracked upon delivery. Anderson will be sending a replacement sash. Now it was time for the framing crew set the windows off of their lift platform one at a time. Two of the workers were outside to set the window into the opening. They fastened the window in one top corner. Then, they would place a level on the top to make sure it was level from side to side. When satisfied, they fastened the window across the top. Next, another worker was inside with a small pry bar. 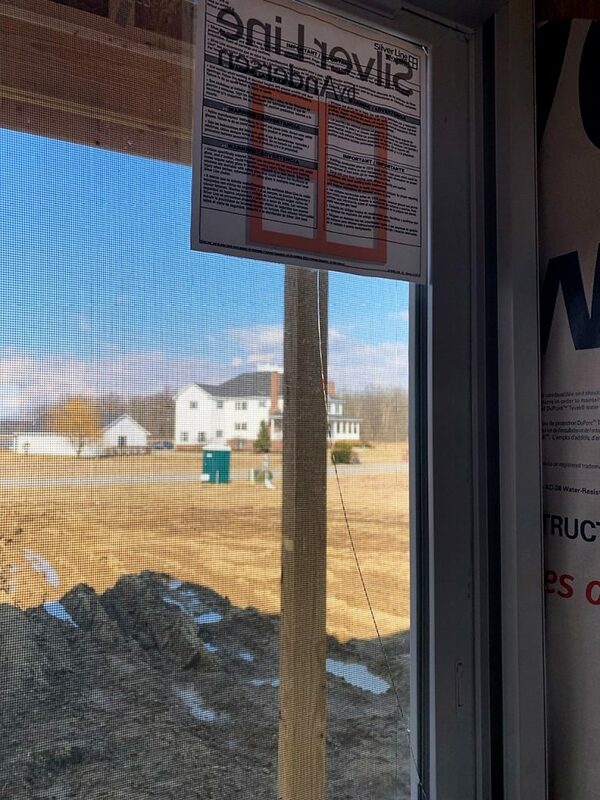 The workers outside placed the level on the side of the window and would give instructions for the worker inside to pry the middle or bottom in/out as needed to make sure the window was perfectly square. They would continue to drive nails through the nailing flange on the window to secure. Finally, the workers installed a type of flashing tape down the sides and across the top. This will also prevent any water from getting behind the house wrap. 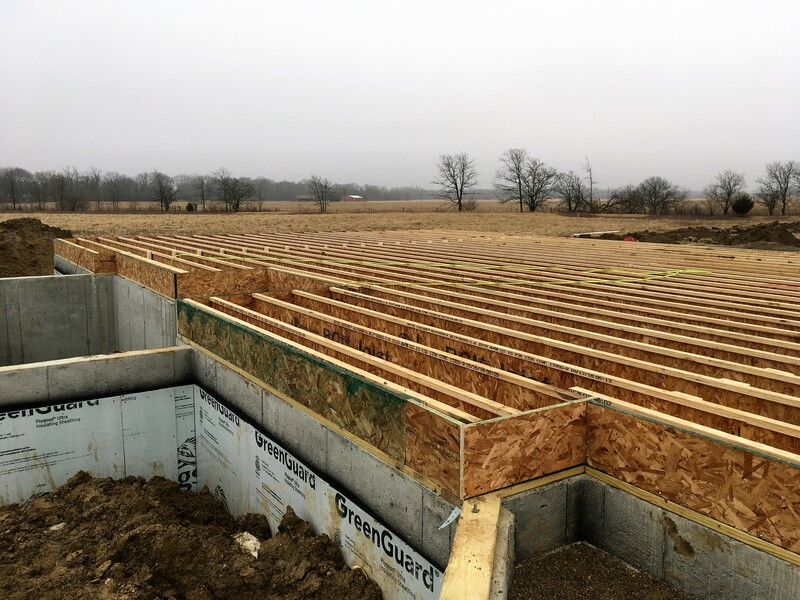 The framers continued this process until all of the windows in the house were installed. Underneath the bottom nailing flange, you can see the flashing tap that was installed prior to the window being set. Window set with flashing tape around the top and sides.